Guns have just finished in Norway. No account of how the show went but reliable TT’s found the set-list. Seems shorter than previous shows on the tour. Once again, a Guns N’ Roses tour is about to begin and few outside their die-hard fan-base are aware. Currently The Most dangerous band in the world are set to play a shocking 9 gigs over the next three months. How they plan to meet this grueling, intensive schedule boggles both the mind and physics. The logistics of trying to get from Denmark to the UK in 1.5 months is beyond human possibility. Learn our limitations Axl, damn it! We’re only people for fecks sake. 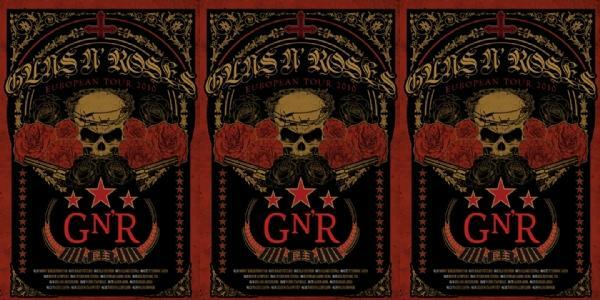 Sarcasm aside, Tickets There stands by Axl and the guys and we’re confident there’s more dates on the cards for us Europeans. Norway, Russia, Sweden and Finland are odd choices but maybe Axl’s sick of the rest of Europe’s bitching….and he’d be right to! Anywho, if more dates come out, we’ll announce em but for now, this is the full list of Euro 2010 shows. Tickets There would like to wish the Guns the best of luck for tonights show, hope everything goes well!! This entry was posted on May 31, 2010 at 10:34 am and is filed under Music, News with tags Axl Rose Europe, European Tour 2010, GNR European Tour, Guns N Roses, Guns N Roses 2010, Guns N Roses 2010 Europe, guns n roses 2010 tour, Guns N Roses Axl, Guns N Roses Europe, Guns N Roses european tour dates. You can follow any responses to this entry through the RSS 2.0 feed. You can leave a response, or trackback from your own site. Please take the tour to The Netherlands. is this the original GNR as in with slash, duff , gilbert, axl etc or just axl and newbies??? ?